Festival season! Camping! Losing all your mates during Disclosure! Not booking enough time off for recovery on your return! Being responsible! Making good decisions! Festivals run the gamut. All of life condensed into a few hot and/or muddy days. It can be glorious, but with all that choice it's good to have a guiding hand to pick out the best of what's out there and the best bands on the bill! Let me guide you...with this guide. 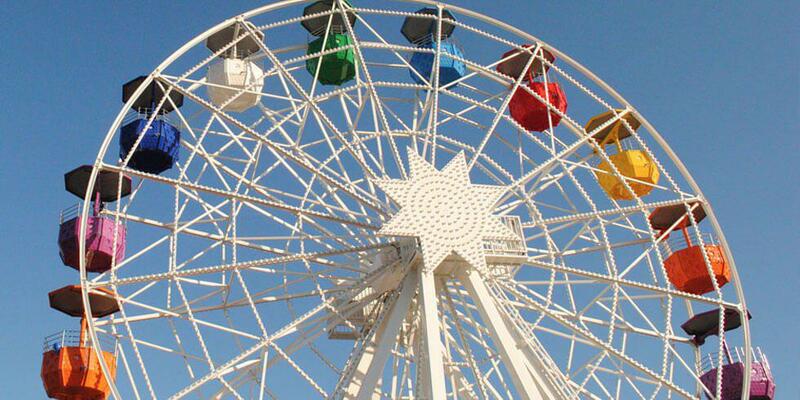 Revel in the ultimate teenage wasteland/Mecca. Celebrate passing, failing or straight up skipping all those exams with the essential Young Brit Right of Passage(tm). There's no need for the country to re-instated National Service as every teenager from this country has endured the trials and life lessons this festival dishes out. All that and it's line-ups continue to expand it's truly eclectic mix of popular music. Heavy hitting rock acts, transcendent dance stuff, up and coming indie bands, brilliant hip hop from all over the world. It's your iPod on shuffle with cheap lager. 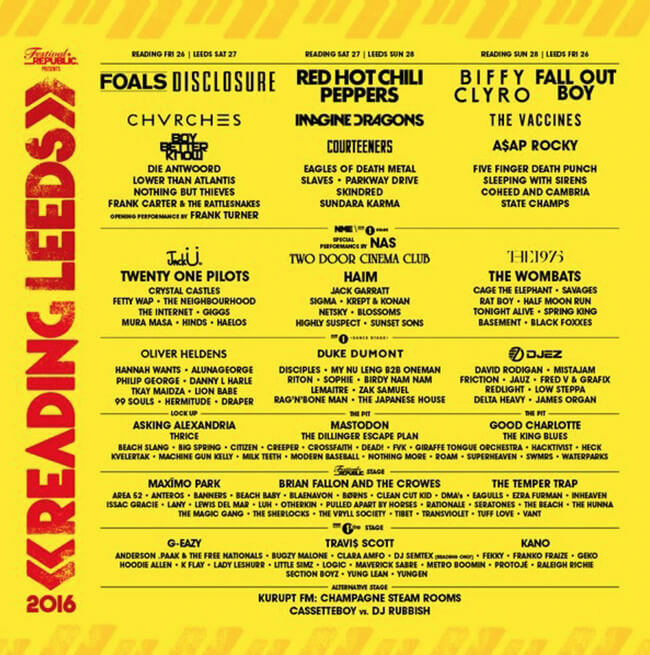 Foals, Disclosure, Biffy Clyro, Fall Out Boy and Red Hot Chili Peppers. Ezra Furman, Beach Slang, Cassette Boy, Kvelertak, David Rodigan. Heck. The Internet. Basement. Die Antwoord. ASAP Rocky. August 26-28 - Richfield Avenue, Reading & Bramham Park, Leeds. 10 years in, this relatively new festival continues to expand. It's just as good to go and see Radio 6 friendly bands as it is to catch nothing but cutting edge (and also good) theatre and dance all weekend. It's comedy line up is worthy of a festival unto itself. Reggie Watts - Comedian Reggie Watts started life as a musician before combining the two. A veritable Svengali with a loop pedal and microphone Reggie flawlessly combines the most surreal and hilarious ideas into the catchiest songs that seemingly appear to be made up completely in the moment. 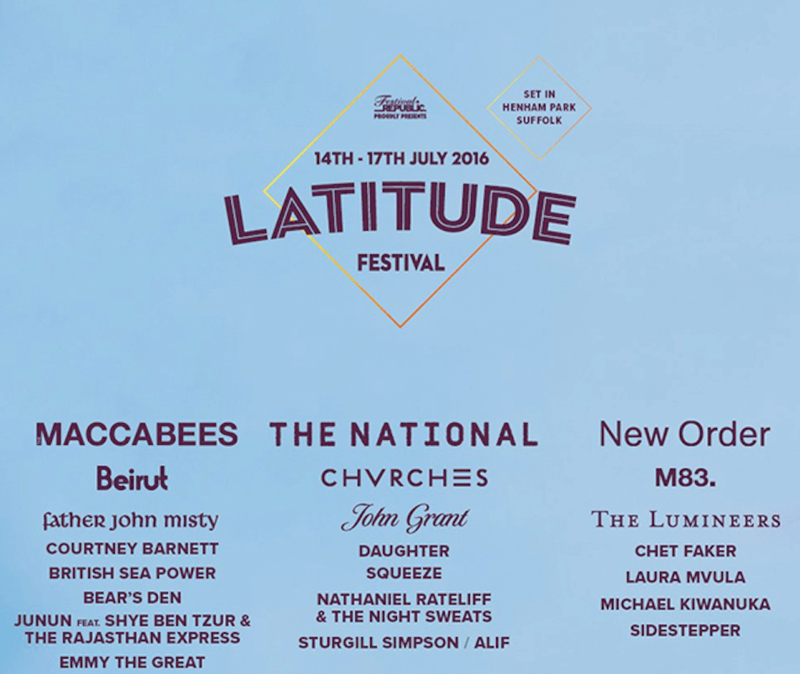 You know when I said that Latitude was a new festival? Ha ha ha, what a joker. This is what you call a new festival. Cause it's actually only 2 years old. 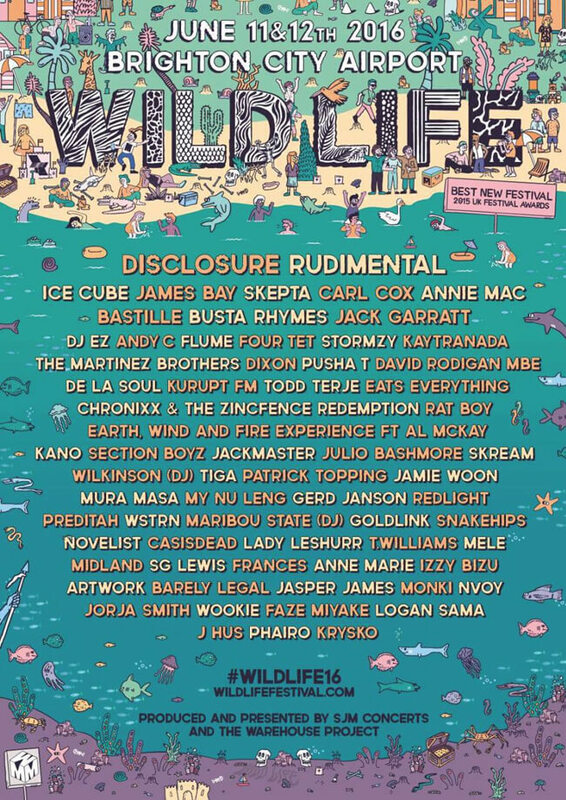 Started by Disclosure and Rudimental and taking place at Brighton City Airport. It's a big big party down south for those big into dancing, hip hop and maybe overdoing it a little bit. Ice Cube. The Avalanches. Four Tet. Pusha T. Todd Terje. Stormzy. Flume. Lady Leshurr. Busta Rhymes. Annie Mac. De La Soul. Kaytranada - although his debut album does at times sound like the kind of music you hear in a fancy hairdressers there's not a dull moment on the whole thing. Guaranteed party even if he just presses play and let's his album run start to finish. The birthplace of watching bands and not bothering to shower. 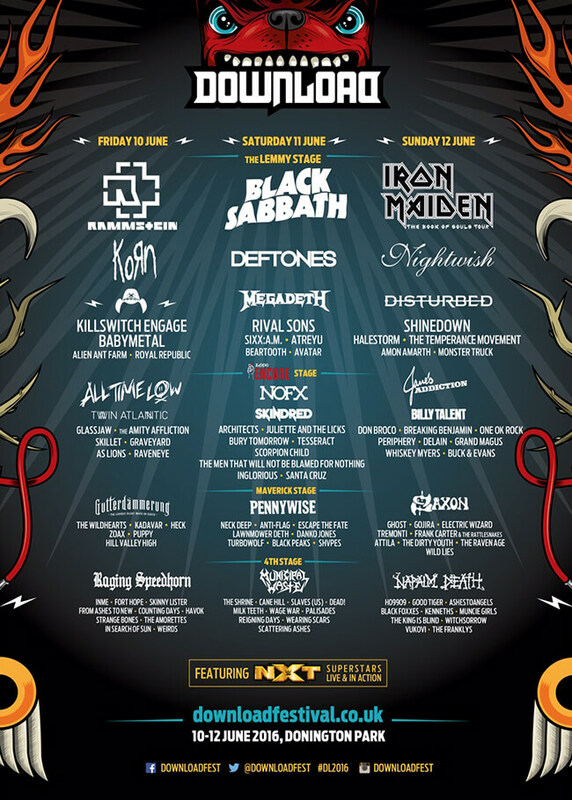 Donington, the home of heavy metal. One of the most well known sites for loud guitars, Saxon patches on denim jackets, cider casualties and metal. Metal everywhere forever. So metal it even has planes flying over it all hours of the day. Rammstein, Black Sabbath, Iron Maiden. Deftones. Juliette and The Licks. James Addiction. Napalm Death. Electric Wizard. Graveyard. Municipal Waste. Ghost. BabyMetal. Muncie Girls - The British indie-punk band just released their debut album to much applause and acclaim. Fists in the air punk anthems with lyrics full of big ideas and right on politics that are well worth getting behind. From tiny DIY venues to a Kerrang! Award Nomination - this is their year. It's small, intimate and always delivers a more handpicked vibe for a line up than some of the bigger fests. It's managed to get The Shins out of hiding. Joanna Newsome will wow some woodland creatures with her harp. The folks at this will have to work VERY hard to find bands on the line up that no one knows to impress each other about having seen something before anyone else. Dr. Dog, US Girls. Frankie Cosmos. Teenage Fanclub. Goat. Broken Social Scene. Tigercats. Martha. King Gizzard and The Lizard Wizard. This year they have Thee Oh Sees. The greatest band of all time. THE END. I'll be down the front. September 2-4 - Larmer Tree Gardens, Dorset. Adele? Pass. Muse? Maybe when I was 15. Coldplay? Pull over, I'm getting off. But wait! Rookie mistake. Everyone knows the real Glastonbury is nothing to do with the headliners. The crowds you see when you watch the pyramid stage highlights on TV from your toast crumb filled bed on iPlayer? It's fake. It's all full size mannequins dressed up to look like real mud encrusted weekend hippies whilst the rest of us actually watch some dead niche Iranian Bhangra DJ do a set with a Yoko Ono hologram projected on the inside of a huge dragon made out of old cars. Don't worry maybe you'll get a ticket next year. Kamasi Washington. ZZ Top. Vince Staples. Baaba Maal. Gregory Porter. Jeff Lynne's ELO. Mac DeMarco. Grimes. Conditions Lauper. Explosions In The Sky. Band of Horses. Floating Points - One of those DJ/Producer acts that you can really classify as a DJ/Producer, so apologies for just doing so. Jazzy and ambient that goes a bit Boards of Canada, then goes Cinematic Orchestra then goes full Sigur Ros. This will be a really special show, go and see him for goodness sake, but if you want to talk do it somewhere else, don't be that guy. 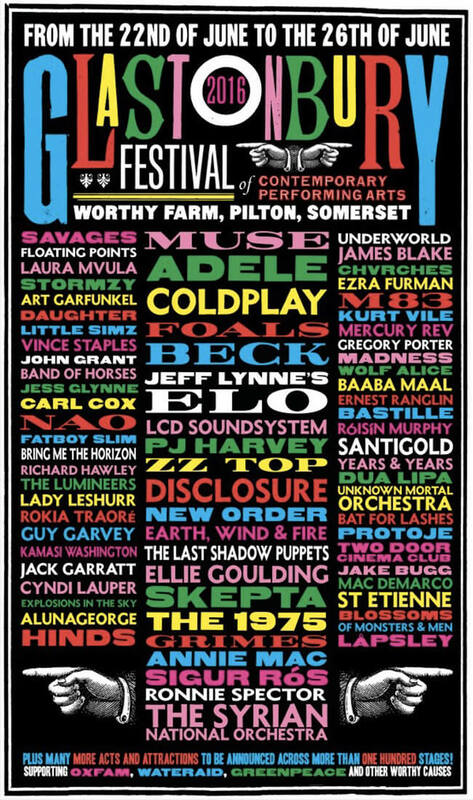 June 22-26 - Worthy Farm, Pilton, Somerset. OK, go out there and have fun. Variety is the spice of life and all that, so as the Spice Girls so rightly proclaimed...Spice Up Your Life!